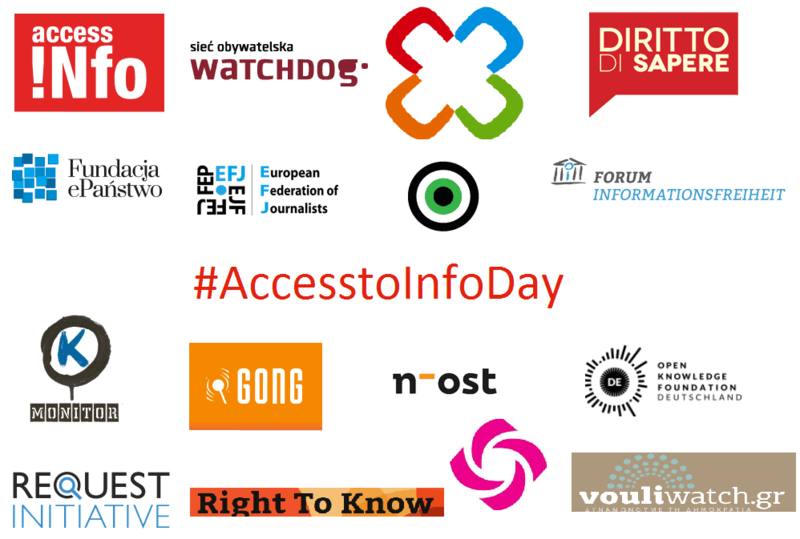 Statement by European RTI Community on the world’s First Official Access to Information Day! Madrid, 28 September 2016 – On the first officially-recognised International Right to Know Day, European civil society groups working on the right of access to information today raised concerns that a lack of government transparency is damaging democratic processes, thereby facilitating rising mistrust and demagogic populism in Europe. Recent monitoring by civil society organisations has demonstrated that while significant progress has been made – there are now 111 access to information laws globally and governments regularly publish key datasets on spending and services – there remain serious shortcomings with transparency of decision making which is shielding much government activity from public scrutiny. The groups reported that one of the biggest obstacles to government openness is a lack of adequate record keeping: list of meetings of public officials and minutes of meetings are not kept, there is no trace of exchanges with lobbyists, and decisions are taken without proper justifications or supporting evidence. Another serious problem is the over-application of exceptions, and in particular the use of the pretext of privacy to veil the activities of public officials when they carry out public functions, such as their participation in meetings or their travel expenses. A particular concern identified by European civil society is that the lack of transparency at the EU and national levels around decisions that are of concern to the wider public. The groups cited the refusal by the EU to release documents on the legality of the EU-Turkey refugee deal (March 2016) as an example of where openness might permit a more fact-based debate rather than a tendentious and xenophobic discourse. The groups criticised these basic fails in transparency, noting that this year also marks celebrations of 250 years since the world’s first freedom of information law, the Swedish law of 1766, was adopted, and that all relevant international human rights bodies, including the European Court of Human Rights and the UN Human Rights Committee, as well as the treaties of the EU and many national constitutions, recognise access to information as a fundamental right. “The right of access to information of public interest is essential for journalists in order to carry out their roles effectively. When such information is made available through leaks, either from private or public bodies, there should be protection for both journalists and whistle-blowers,” said Renate Schroeder, Director of the European Federation of Journalists (EFJ). The 16 groups called for immediate action to reverse this situation, including through improving access to information in practice, advancing on national commitments under the Open Government Partnership, and by signing and ratifying the Council of Europe Convention on Access to Official Documents, the world’s first binding treaty on the right of access to information. International Right to Know Day, now in its 14th year of being celebrated globally, was established by civil society organisations in September 2002. It was formally recognised by the UNESCO General Assembly in November 2015.